In a Europe torn by war and revolution, Berta Altmann comes of age as a gifted artist and independent woman. Her search for freedom leads her from Vienna to the Bauhaus school, Weimar Berlin, and Prague. As she encounters the celebrated artists of her time, she engages in aesthetic and ideological battles that will prove to have life-and-death consequences. Based on the real-life story of Friedl Dicker-Brandeis who taught art to children in the Nazi transport camp of Terezín and died in Auschwitz, Aaron’s Leap is framed by the lens of a 21st-century Israeli film crew that unknowingly unleashes the haunting force of buried history. 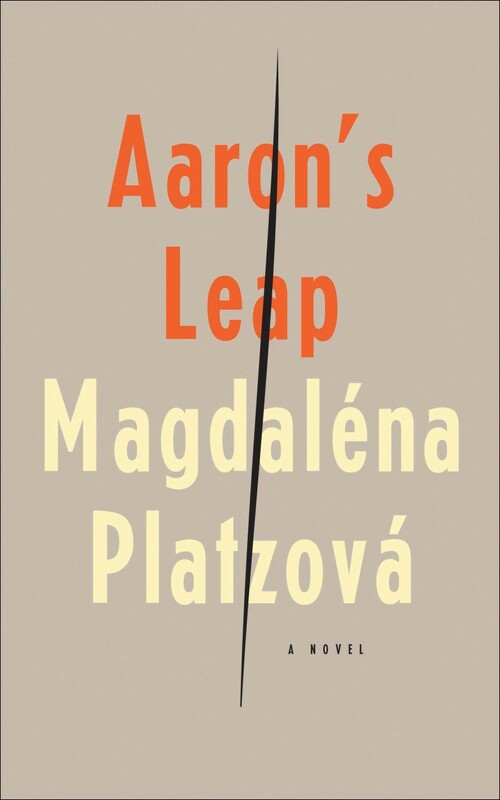 Magdaléna Platzová’s novel Aaron’s Leap is translated from the Czech by Craig Cravens, the author of The Customs and Cultures of the Czech Republic and Slovakia whose translations include My Crazy Century by Ivan Klíma (Grove/Atlantic). A graduate of Amherst College and Princeton University, he is the president of the North Atlantic Cimrman Association and a Senior Lecturer in the Slavic department at Indiana University in Bloomington. Who is Berta Altmann? Who is the I that is asking? Is it really possible to suddenly cease to exist? What does it mean that I survived while they are dead? How can I believe it? How can I accept it? Does some kind of soul really exist? Or is there only darkness and decay after death? I am alive and they are dead. Their beloved bodies—a convocation of worms. Oh God who does not exist! God in which I long to believe at moments such as this! Where can I turn? What can I lean on? How can I bear this loneliness? The most difficult word: Forever. And—nevermore. The model never stops moving, quickly or slowly, according to the rhythm the teacher beats out on the drum. Snowflakes descend on the glass roof of the studio forming tiny drifts, melting and sliding down from the warmth from inside. The blue glow of the evening outside, the fireplace crackles. Vienna is languishing from a shortage of wood, but here, because of the naked models, they must have heat. That’s the main reason evening drawing classes are so popular this year, the students come to get warm, say the professors. They envy the success of the new teacher, Meinlich, who was accepted from the Academy of Applied Arts in September to replace the late drawing professor Janecek. A wave of enthusiasm swept through the students during the first few weeks of the school year, primarily directed at this young man wearing wire-rimmed spectacles. Almost none of the professors can make sense of the enchantment that has possessed their charges. The students work with much greater diligence and overflow with ideas, but they’re also unruly. They want to do everything their own way and they’re brimming with bewildering ideas, which they could not have come up with themselves. They insist that each lesson begin with a ridiculous ten-minute breathing exercise which is supposed to help initiate the flow of the subconscious and free the creative powers. A naked man on a wooden platform in the middle of the room halts at Meinlich’s signal, drapes a blanket over his shoulders, and sits down to rest. Berta drops her charcoal and waves her hand, which is already starting to hurt. She’s here for the first time after a long illness. She doesn’t know how to draw a moving body or even what the drum and rhythmic breathing of the students are supposed to mean. She also doesn’t understand the religious silence of the students that sets in at the beginning of class when the teacher enters and starts speaking in a soft, indistinctive voice. She understands nothing, but she doesn’t care, she views events from outside, armored in her sorrow. She was afraid to go back to school where she won’t find Maja. And now she’s here, surrounded by familiar and unfamiliar faces; she’s indifferent to them. She sits and holds her scratchings on her lap. Meinlich walks among the students and examines their work. Here and there he injects a word or adds a line with a piece of charcoal, illuminating the drawing from another angle. When he halts by her side, Berta blushes: I’m here for the first time. Don’t think, says Meinlich. Follow the curve of your breath, and with your hand the movement of the model. From a distance he looks like a boy, but up close he doesn’t appear so young; he’s definitely over thirty. When he smiles, wrinkles gather beneath his round spectacles. Something in the timbre of his voice or in the way he speaks produces a feeling of tranquility in the listener, as if he were being absorbed by a warm, clear center. Later his enemies will rename him the Snake Charmer and mock him, but Berta, just like her classmates, will succumb to him. The snow is still falling. At the end of the hour most of the students pack up their things and, after respectfully saying goodbye to Meinlich, depart in groups of twos and threes. Berta packs up her drawing supplies and sketchbook in her leather satchel but is in no hurry to leave. She doesn’t look forward to going back out into the chilly darkness. She’s not the only one who’s remained behind. A circle of five boys and girls has formed around the teacher, and they’re trying to talk him into something. Apparently they’ve acquired his consent and are merrily moving toward the door. When they pass Berta, who is still sitting lost in thought, one of them stops beside her and says: We’re going on a walk with Robert. Want to come? It’s a little cold, but Robert doesn’t go to cafés. A darkened terrace; inside, bright chandeliers and the faces of her friends. Red wine, in connection with something unpleasant. And then he shot his brains out! She looks up: Do you know they’re dead? Maja and Rudi? Just pronouncing their names makes her eyes well with tears. Come with us, he says and picks up her bag. Just come. …They became inseparable. Together they floundered through the anxieties of winter and together they greet the spring. They have ventured outside the city to the river. The young leaves are budding on the trees, the forest on the opposite bank is a translucent green, and the sun is slowly dissolving the morning fog. The ground is still cold, but there’s a feeling of downy softness. And relief. Suffering is unnecessary, thinks Max. Pain belongs to the old, and the old to the past. We are building new cities full of light and gardens, where people will learn to be happy and free. The colors of our paintings will introduce love into people’s hearts. In the new society, without coercion, without jealousy, we will share our art and our life. Berta bends down for a nicely formed branch. She turns it over and thrusts it into the soft earth. It’s a bird. They reach the southern slope which the sun has already managed to dry. Berta turns around several times, closes her eyes, and plops down on the grass. I would like to go to Italy, she says. Let’s go, nods Max. He feels the grass with his hand and only then sits down. Today for the first time he is wearing his light trousers. The sun spreads in all directions upon the surface of the water, lightly stirred by the wind, and suffuses their eyes with radiance. Berta spreads her arms wide and cries out like a hawk. They breakfast on sandwiches Berta has brought along from home, wash them down with bottled water, and then take a walk along the river. The sun is beginning to burn. Max makes a little hat out of his handkerchief and covers his head. His sensitive, white skin is beginning to redden, and his freckles are breaking out. Listen to Magdaléna Platzová discuss her work on Trafika Europe Radio and with Words Without Borders. Read a preview from Magdaléna Platzová’s novel Aaron’s Leap in A Public Space magazine.